Today’s project is a one of a kind bungalow full of art that exudes a zest for life! The clients are a couple of empty nesters who wanted their bungalow dream home for two. 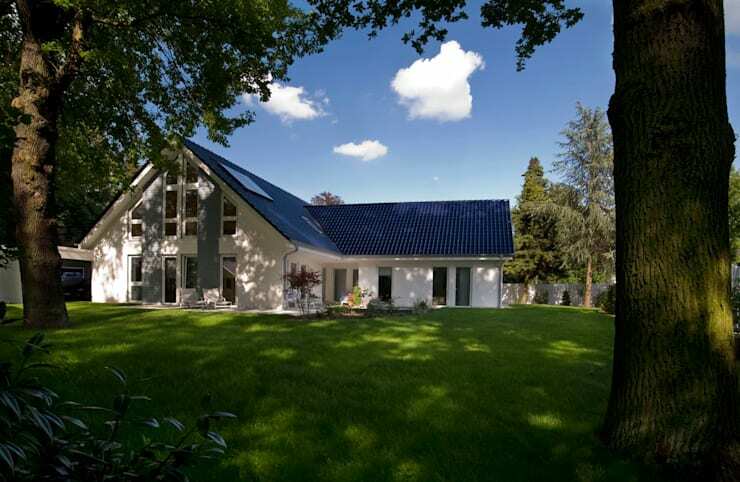 This home is architecturally stunning and replete with modern luxuries. The architects at Haacke House followed aging in place principles when building the home. It is built with accessibility in mind. Open floor plans and wider doors allow for easy living on one level. The attic space is converted into a small apartment, should they desire in-house support staff in the future. This home might be built for a couple later in their life, but the home is as funky and exciting as if it were built for a couple of young newlyweds. Ready to check out this fabulous bungalow where you can live in style? Let’s start our tour now! What a darling home! The expanse of green grass leads right up to the terrace. Established trees provide shade for the property. The home itself is a prefab. It is The is well-proportioned and designed to be full of light. The white plaster facade is a fun retro touch to the home. Ribbons of blue-gray larch wood planking accentuate the tall and narrow glazing. 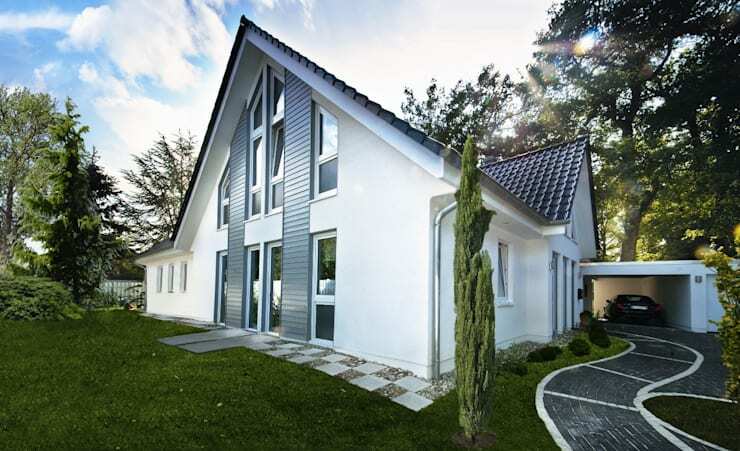 A shining gable roof tops the home and gives it a classic shape. Step inside where the large windows bring daylight to this open plan living space. 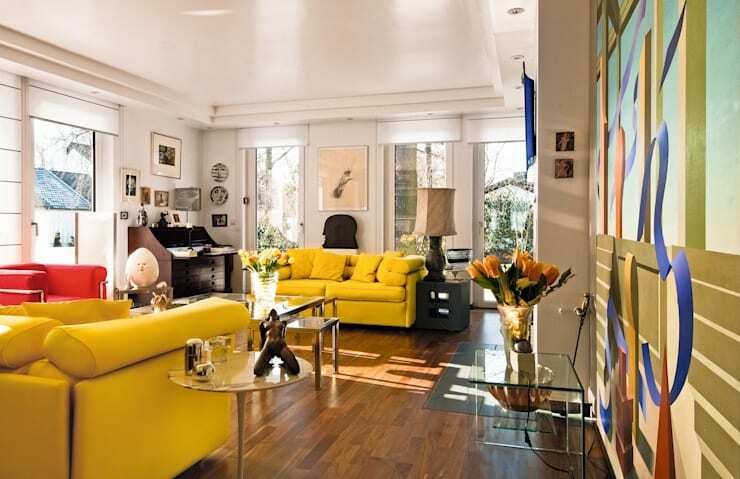 Lemon coloured sofas and glass furniture create an exciting retro vibe inside. The couple who live here surrounded themselves with their favourite treasures. Collections of sculptures, figurines, and artwork are on display. They brighten up the home and give it its funky personality. An eye-catching chandelier glimmers above the table and reflects off the glossy ceiling. This dining room is bright and spacious. White walls create the backdrop for oversized paintings and prints. The room is connected to the outdoor terrace space by glass doors. In warmer months, the couple could even take their meals outside! This fresh and sophisticated space is great for entertaining every day. This kitchen is connected to the living and dining space through a sliding glass door. Shades of white and grey dominate the look and create a crisp modern kitchen. 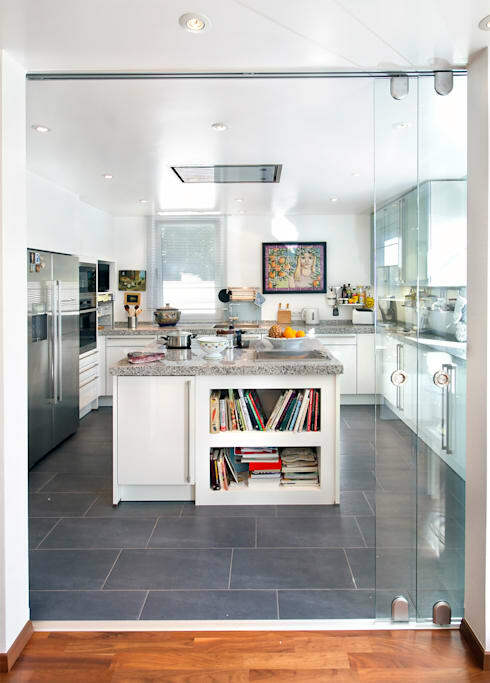 The island in the centre has shelves to hold cookbooks, a fantastic addition to anyone who loves to cook! Here’s a closer look at one of the quirky pieces of art on display in the home. 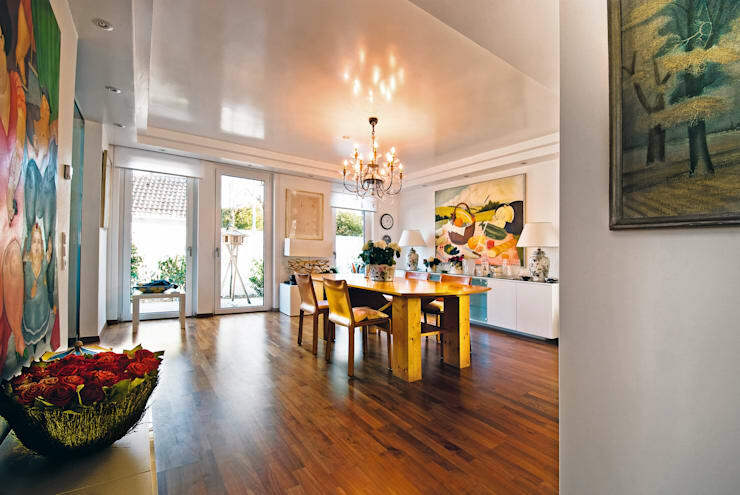 The home has two fireplaces and underfloor heating so that the couple is warm and cozy all year long. Solar panels on the roof support their hot water needs. Controlled ventilation helps reduce the pollutants and allergens in the air. By using consistent ecological building materials, the architects built a healthful and eco-friendly home. Living on one level is the way to go for this couple. 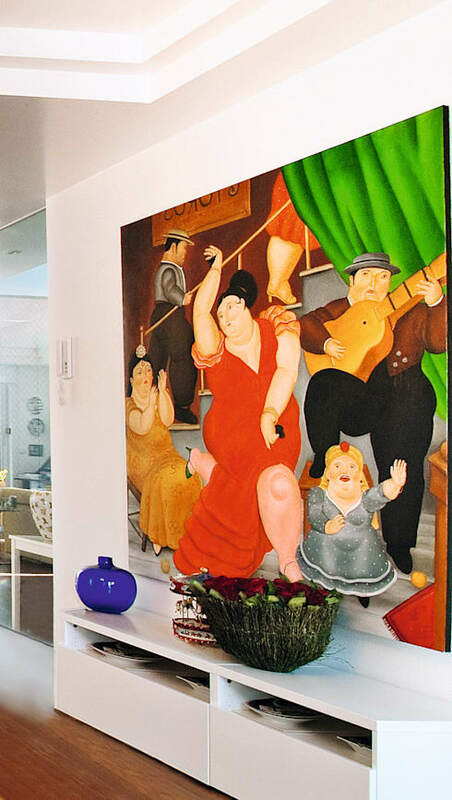 Their home has serious style and they’ve filled it with their funky art collection to create a beautiful home that will last a lifetime. We hope you enjoyed our tour of their exciting prefab home! Next, check out our feature on the ultimate modern eco-friendly chalet. What do you think of the bungalow's art collection?